Has represented England at U17 and U19 level before making her international debut in the European Cup in 2001. Called up to do duty in the 2002 triangular series against India and New Zealand Isa showed that maturity is not just about years, being placed second in the bowling averages, and perhaps unexpectedly, leading the batting averages! Batting in a 'Possibles v Probables' match at Aldershot. ... and bowling at the Grainville Ground, St. Saviour, Jersey. Playing in the Test match against India at Somerset CCC, Taunton. 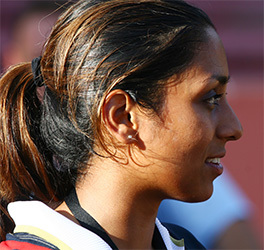 The keeper is Sulakshna Naik. 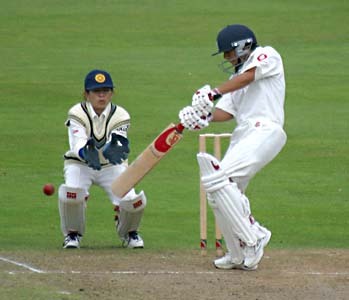 Appealing for lbw during a match against an England boys side at Fulking, England, 2004.